“Love is the wonderful experience of feeling connected. A story to help you connect in our disconnected world. THIS STORY HAS THE POWER TO ENHANCE EVERY RELATIONSHIP IN YOUR LIFE! 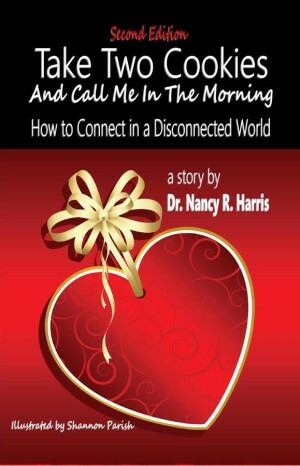 Take Two Cookies and Call Me in the Morning – How to Connect in a Disconnected World shares with you the story of one woman’s personal transformation and her unique discovery that love is like chocolate chip cookies. Love has a repeatable recipe. Unfortunately, Liz, like most of us, leaves home without having learned all the ingredients or knowing how to create loving connections. This short yet powerful adult storybook takes you on Liz’s journey as she discovers each ingredient and creates a unique recipe for loving. Through Liz’s experiences, you will learn the secret to connecting in a disconnected world. “The power of this little book is in its simplicity. “LOVE is like chocolate chip cookies. It is made of many different ingredients. The key to making great cookies (or love) is KNOWING THE COMPLETE RECIPE. is the journey called life. “Learning ‘How to Connect’ will teach you how to experience what love is. And Love, like Chocolate Chip Cookies, has a recipe. I will give you two of the main ingredients. 1. Slow Down – Simplify Your Life by setting intentions. 2. Discover Your Spiritual Life Purpose. The additional eight ingredients you will discover by reading Take Two Cookies and Call me in the Morning. To order a softcover copy, please visit BarnesandNoble.com or Amazon.com, or wherever quality books are sold. Kindle edition available through Amazon.com.